Clearspan tents sometimes called free span tents are built with an aluminum engineered truss system that is assembled on your site and secured to the ground with stakes or weights. The trusses are raised to their upright position after assembly and cross cabled to give the tent its structural stability. The roof panels and sidewalls are slid into locking Kedered grooves providing weather-tight seals at each structural member. Some of the many benefits of this tent system are no poles in the center of the tent to hinder your placement of tables or visibility. Base plates are secured to the ground with stakes much like big nails into the earth. Clearspan tents allow you to use much more of your available space for the tent because they do not require the extra space on the outside for the ropes and stakes as other types of tents require. Kedered locking grooves provide a much tighter seal than most rope mounted sidewalls locking out wind and rain. Our clearspan tents have engineered wind ratings exceeding 50 miles per hour. 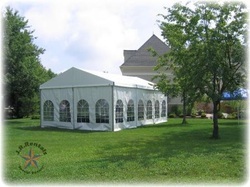 This makes clearspan tents perfect for formal functions like weddings or corporate events. Clearspan tents are also excellent for long term tent rentals like equipment storage, construction shelters, or disaster relief shelters. Clear span tents can be used any place you need fabric structures, temporary structures or any size of temporary building large or small. with window sidewalls shown closed. 10 ft. increments up to 80 ft. long. on an asphalt surface with window sidewalls shown closed. 10 ft. increments up to 70 ft. long. This tent is shown weighted but may be staked as well. Tent weights may be covered with linens or vinyl covers. 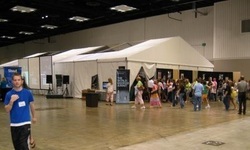 A 40 ft. x 80 ft. clearspan tent installed inside the Indianapolis Convention Center with solid sidewalls. Roof sections were left open to comply with sprinkler fire codes. Tent was used to provide privacy for a theatrical production. This tent may be staked or weighted. white sidewalls. 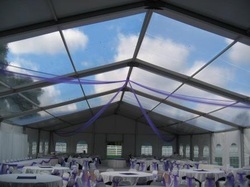 This tent also has the optional glass entry doors and the optional clear roof panels. The floor system with full carpet was a nice touch for this tent. 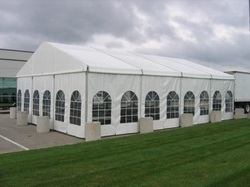 Click on this picture to view a 50 x 200 ft. tent of this type. up to 200 ft. long. This tent is available staked only at this time.